Part 1 of the experiment on YouTube! The Equipment I Use and LOVE! And why! How difficult is it to put on 10 lb (4.5 kg) of muscle in one month? I put this question to the test with an old-fashioned experiment—but in a practical sense. Simple workouts, simple eating, and simple recordation. I have placed various links and descriptions to the equipment that I use and love, as well as some other items that I enjoy that may interest you and your health goals (protein mix, books, etc.) If you happen to purchase something on Amazon within the link window, then I receive a small finder’s fee—and I will be thanking you with many, many positive vibes! Thank you for reading and good luck with your fitness goals! If you want to try something like this experiment then that's great! Please keep in mind that I am not a medical doctor or a licensed fitness trainer. And although all of my methods are safe, always consult a qualified professional when it comes to your health. I'll cut to the chase: Three years ago I was on the brink of an early death. After having faced the true fragility of my mortality, I made changes as to how I would approach life, for we have no guarantee of our time on this planet. Life is about learning and sharing, and so about a year ago I created Koaw Nature on YouTube as well as Koaw.org to teach about what I know and learn about nature, other cultures, fishes, and other cool tidbits of info for anybody who cares to enjoy a thing or two about our world. Some say I waste my college education—I just say I'm doing things a bit differently. And why am I doing this experiment? For starters, I’m a nerd and I love doing experiments! I’m also sharing it here to show that positive change can occur with a bit of time and effort, no matter what kind of goal you have, be it fitness or otherwise. Please remember that we all have a different starting point for any fitness goal. I do understand that I began this experiment in fairly decent shape (gaining muscle was a more practical goal than losing fat.) If you desire to do an experiment like this then set a goal that is reasonable within your life's schedule and your body's limits. I also filmed and wrote about this experiment because I want my audience to have the opportunity to get to know me better on a personal level. Finally, the experiment stemmed from an epiphany: Within my first year getting Koaw Nature up and running, I’ve discovered the intense competition that exists on YouTube. There are many great creators that produce quality entertainment and education. Standing out on such a crowded platform is going to be challenging task. I need to be in top physical and mental shape to be able to do intense fieldwork and provide content that is not only entertaining but also educational. I want to provide you with better productions; therefore great fitness is a necessity! If we remember back to our Biology 101 course—experiments need a hypothesis—or an educated guess as to what will occur. Measuring difficulty in this experiment is purely subjective; that is, it depends on the individual and what that person considers as easy and difficult. So quantifying something like difficulty is a loose approximation. My hypothesis is that gaining 10 lb (4.5 kg) of muscle in 30 days will fall somewhere just above the mid area of easiness and difficulty (leaning towards the difficult edge)—where easy is that it doesn’t cause me any problems, discomfort, and use up too much of my free time, and difficult is that I become very burdened, feel much discomfort, and all my free time is consumed. The methods are simple. Workout 4 times a week or so. Eat plenty of food often and ingest protein shakes around workouts. Record weights in the morning and night, and briefly describe what was eaten that day as well as the type of workout and how long the workout lasted. Sleep is also important; the body cannot repair without adequate sleep and so I recorded how much I slept each night. Most importantly, the experiment can’t get in the way of other daily responsibilities. And there is no need to stress about the progress—it’s an experiment—there is no wrong answer, only discovery. Oh, and of course I have to film for all of you. I’ve never been a big man—I’m approximately 5’ 11’’ (1.8 m) and my body always wants to fall back to 152 lb (69 kg)—gaining weight is actually tough for me with my metabolism. And I’m in my early 30’s, so I’m already past my physical prime—that is, my hormone production (i.e. testosterone) is no longer at its peak for ideal muscle growth. For the first morning—I weigh in at 151.5 lb (68.7 kg.) That means in 30 days, or in only 720 hours, if I do not weigh 161.5 lb (73.3 kg), then I was not able to accomplish the weight-gain task within the parameters of the experiment. My typical workout centered on being efficient with time. That means only spending around 40 minutes in one day working out. Circuit training is a great way to work multiple muscle groups and do cardio in very little time. Of the 24 workouts I’ll complete in these 30 days—my average daily workout was only 42.5 minutes. I really wasn’t using up that much of my free time and the workouts were not too demanding. The Key: Muscle gain is all about making your muscles do more work against resistance than they normally do. That expression 'feel the burn' applies to knowing when your muscles are exceeding that normalcy. I began the experiment with light workouts, as anyone should do when undertaking a more rigorous workout schedule so as to avoid injury.For me—I don’t care for machines that work target muscles. Why? I don’t need a body built for aesthetic appeal and I'm not rehabilitating any muscle groups—I need a body that is capable of agility and strength in a demanding environment. Exercises that force multiple muscle groups into action are far better for a body that needs to function at high levels in nature. Free-weights and resistance bands will be my friends in this experiment. Without a doubt, my two favorite pieces of equipment are my Bowflex 552 Adjustable Dumbbells and my BOSU Ball. In combination, a simple exercise like a bicep curl turns into a full body exercise as the stabilizer muscles are forced to work along with the target muscles. This is an amazing form of exercise efficiency. The Bowflex 552 Dumbbells may seem a bit pricey (around $249 on Amazon) but they adjust from 2.5 lb - 52.5 lb! That is like having an entire rack of weights in your home which would cost more than $1,000 and take up the space of an entire wall! My sister and her husband also own a pair of the 552 Dumbbells & bench combo and they love them! For more weight, use the Bowflex 1090 series, which go up to 90 lb adjustment levels; these are great too for people using the extra weight. And do not go cheap on a BOSU ball! There are many types, but I do most of my exercises on the flat side and a sturdy, adhesive surface is absolutely necessary. I've used other, cheaper BOSU knockoffs and I've almost injured myself from slipping. The Bowflex 552/1090 (with stand/bench or solo) comes with a short DVD that shows some great exercises. It's worth giving it a glance because proper form is very important during any exercise. The other essential pieces of equipment that I love to use are resistance bands, a soccer ball, a fitness ball, a high bar, a kettle bell, and my heavy bag. Resistance bands have advantages over free-weights because they can keep constant tension through an entire rep. A soccer ball is my favorite warmup tool—but it also turns simple exercises like a plank and a pushup into those more demanding, core stabilizer workouts. A bar is great for the back and core muscles. 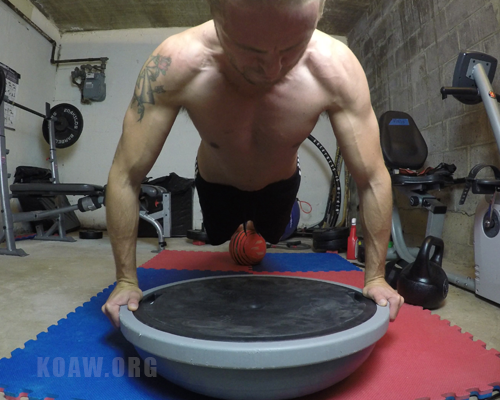 Use the kettle bell with the BOSU ball and that is core magic. And a heavy bag is just great for cardio, agility, and strength. I did, on occasion, wear my weight-vest. Slapping on an extra 30 to 40 lb (13.6 – 18.1 kg) will definitely add resistance to any movements. I will not link the one that I own because I find it inconvenient as the sandbags fall out too easily. I regret buying a cheaper product; however, I will recommend a product that will be my next gym purchase. Weighted vests are adjustable, so starting with 5-10 lb is a great way to start out. I use weighted gloves and hand wraps when not going bare knuckle on my bag. Added 1 lb of weight to each hand really intensifies the bag sessions. A bench. Any home gym needs a bench. Enough said about that! 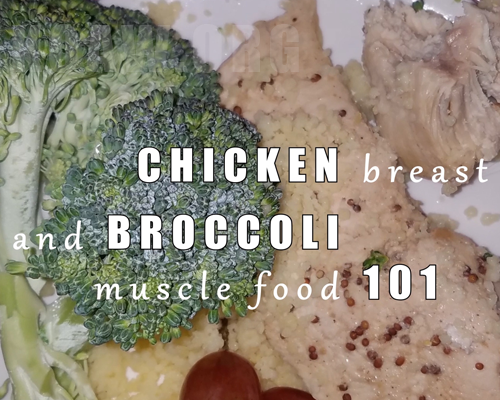 Broccoli and chicken breast. Yup, those are important. For vegans and vegetarians, finding that cheap, high quality protein is a bit trickier. But for me, I'm an omnivore. I began most days with a breakfast of cereal, milk, and banana. This was an odd adjustment for me, as I normally do not eat breakfast. The rest of the day was filled with around four other small meals, snacks, and the occasional protein shake. I did not eat on a schedule—I just avoided ever trying to feel hungry. If hunger sets in, then the body has begun denaturing fats as well as proteins within muscle for sustenance. No es bueno. Also, I didn’t count calories—this is supposed to be a simple experiment and counting calories can be a bit tedious. Though, I recommend counting calories for anyone who isn’t familiar with the basics of understanding how many calories are eaten in a single meal. Since I had counted calories for a couple of weeks when I was younger, I developed a solid understanding of how much energy I was using, eating, and needing. Finding a good protein shake that works well is hard. It took me awhile to discover one that did not give me horrible gas! I finally found one when I bought a more expensive brand at Whole Foods (Garden of Life) which is actually sold cheaper on Amazon (here.) It’s a plant-based organic protein shake—I usually buy the chocolate or vanilla flavor. I have used the full MEAL + protein type of this brand. Both types are great—but again, there are a lot of protein shake mixes out there and it really comes down to what the bacteria in your gut agree with. These are vegan, plant-based organic mixes. But don't worry, you don't have to be a vegan to use them! Any gym is packed with inspirational clichés and upbeat adages scripted on half-torn posters—that's not a bad thing! Sometimes we just need those reminders of simple logic. I have my own sort of posters scripted in my mind concentrating on three fundamental ideologies for a better, healthier life. The first cornerstone of my ideology: We should never stop bettering ourselves. No matter the existing age, education, ethnicity, religion, socioeconomic status, or gender, we should always seek to improve ourselves on a daily basis both physically and mentally—and for many, spiritually. This experiment offers a convenient way to monitor a method of myself undergoing a bettering. Gaining (or even losing) 10 lb (4.5 kg) of weight in one month is an ambitious goal for any individual. Many of us just want to get in better shape so that bathroom mirror is a bit less daunting (myself included)—but often, those hopes never reach fruition because of, well, excuses. That brings me to my life ideology number two: No lies. As humans, lying is natural for us—it is hardwired into our bioneurological makeup—an advantageous quality preserved by evolution. But truth, believe it or not, is a much more powerful tool to harness for self-betterment—and for the betterment of everyone. The final cornerstone of my ideology is that failure is okay. Simply put, we don't find success without failure. Michael Jordan missed plenty of 3's and missed buzzer shots, but he learned from every one of those moments. Failure is not something to strive for, but it shouldn't deter anyone from seeking to accomplish a task. I gained 10 lb of muscle in 30 days. (Results below.) The target weight was gained a few days before the experiment was set to end. For a summary discussion of this experiment, see the videos! They really capture the essence of this experiment. However, I will say that the experiment was quite educational. I learned much about what it takes to live a busy life and accomplish as fitness goal. Besides the early injury, the cold showers, and the excessive eating, I would say that the gaining 10 lb of muscle in 30 days was far easier than I had hypothesized. Good luck with your fitness goals. Let me know if any of this was helpful or you have any questions. Drop a comment on a video or contact me through the form on this site.